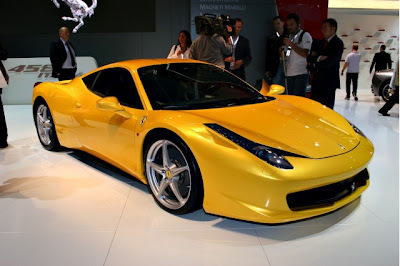 You may have heard of Ferrari's newest super star sports car - the 2010 458 Italia. The car was launched to the public last September on the Frankfurt Motor Show and will be available on Ferrari showrooms by 2010. This new two-seat racing monster carries an astounding 570 Horsepower engine from a direct injected 4.5-liter V8 and it can blast from zero to 60 mph in just 3.4 seconds. Tell you what; the screaming sound produced by its 398 lb-ft of torque and 9,000 rpm redline is absolute music to every auto enthusiast's ears. According to Ferrari chairman Luca di Montezemolo, this fabulous new car is a perfect icon of high performance and is the first of its kind to ever achieve the superior novelty that no other Ferrari has ever reached. The car model is dedicated to Italy for the imaginative finesse of its people thus producing the top quality style and product which is a clear manifestation of excellence. 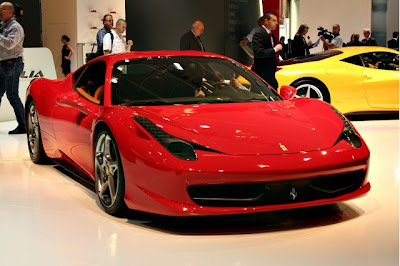 The company is proud to announce that the 2010 458 Italia is one of the best designs that they ever produced. Here are some of its photos from the car show that come in stunning red and yellow color which is a trademark of Ferrari.